The small island nation of Kiribati’s highest point is no more than two meters above sea level, which makes it one of the most vulnerable places on Earth to rising water levels. The country is one of the most vocal global advocates for action on climate change, but with the problem of a rising sea lapping at their doorstep, they have considered some pretty drastic measures in recent years, including relocating the entire population of around 100,000. 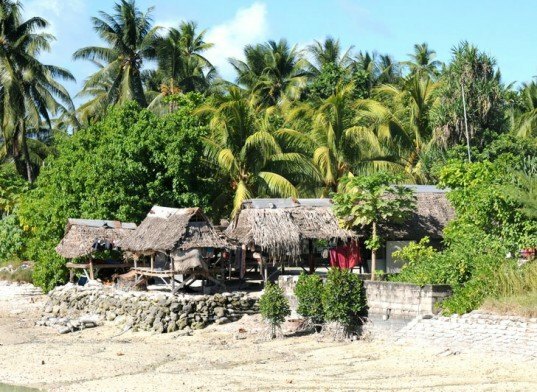 In 2011, the President of Kiribati told the world he and his cabinet were considering a plan to purchase a slot of land on the main island of Fiji where they could relocate their population of about 100,000 if climate change indeed caused waters to rise, making their nation uninhabitable. Soon after, Kiribati President Anote Tong told the 2011 Pacific Islands Forum in Auckland that the nation was also mulling over a plan to build a $2 billion man-made island that could take the place of their disappearing homes. “We’re considering everything… because we are running out of options,” Tong told those gathered at the forum. “If you’re faced with the option of being submerged with your family, what would you do?” Tong asked. “Would you jump on the rig… on a floating island or not? I think the answer is yes.” Tong noted that the island nation, which has a high poverty rate, could not afford to build the man-made island themselves and would need international assistance. The Kiribati President has harsh words for the current pace of economic development and its negative effect on nations like Kiribati who have no defenses against rising waters and climate change causing emissions. “For those who believe climate change is about some distant future, I invite them to Kiribati. Climate change is not about tomorrow. It is lapping at our feet – quite literally in Kiribati and elsewhere,” United Nations Secretary-General, Ban Ki-moon told the audience gathered at the forum. The Secretary-General had visited Kiribati on his way to the conference. It seems wealthier nations have offered Kiribati financial assistance yet little of those promised funds have actually made it through. Moon warned that the rest of the world needs to work harder to start reducing emissions and introducing emissions-free energy production or small nations like Kiribati will be doomed. I nice 2 year follow up Brit Legit. Better idea than moving your whole population to some other country.